Jonathan is an accomplished Auctioneer specialising in Fine Art, wines and spirits, taxidermy and field sports memorabilia. He is a Trustee and Director of two important Art Trusts – The Cedric Morris Foundation and The Victor Batte-Lay Foundation, whilst his considerable rostrum presence has made him our most sought after Charity Fundraising Auctioneer. 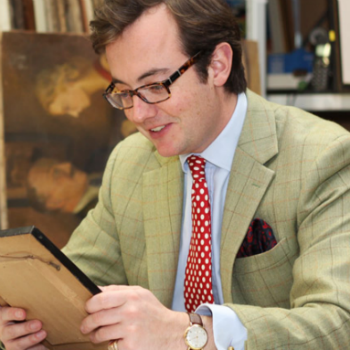 “I started working for Reeman Dansie in 2004 as a Trainee Auctioneer and Valuer, having previously worked as a part-time porter whilst at school. My love of auctions has been passed down from my grandparents, who attended auctions themselves and had a house full of interesting finds. In fact, when I was very young, I only ever wanted to be one of two things – an auctioneer or an undertaker, believe it or not! As a specialist in Victorian watercolours, I get huge enjoyment out of being able to imagine what individual artists saw during their own period of history, whether that be three hundred years ago or only a few decades. Sometimes the landscape in the painting hasn’t changed at all and sometimes you wouldn’t even recognise the landscape if you were walking through it. Art can provide a photograph of that time, a window into how the area has changed. I also enjoy working with contemporary artists and their descendants and have handled some spectacular Studio Sales, which always create a lot of interest. The two collections that particularly stand out for me are the collection of ten Edward Seago oils and watercolours belonging to the famous Royal Butler, William Tallon, who was a personal friend of the artist and a collection of Cedric Morris oil paintings which came direct from his studio, which I found incredibly exciting to sell.